I love this book. I own multiple copies as they tend to get battered from heavy usage in my classrooms. My current class of one and two year olds is too young to sit through it or appreciate it but several of my copies are on loan to the preschool classrooms. "The True Story of the 3 Little Pigs!" 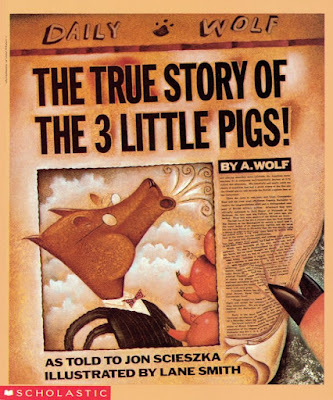 is a twisted, slightly demented version of this classic fairy tale, told from the wolf's perspective. It was all a misunderstanding, you see; he just wanted to borrow a cup of sugar to bake a cake for his dear old granny. But those rude pigs wouldn't cooperate and well, he had a bad cold and sneezed so hard that the houses, and the pigs, just keeled over. Pinky swear! LOL The humor in this book appeals to me as does the skewed perspective. It never fails to make me smile, giggle, and chortle. Preschool children and school age children love the skewed perspective while some, who are more familiar with the traditional version, will call out 'corrections', "That's not how it goes!". It can, if you are so inclined, lead to discussions about how perspectives differ when more than one person views an event, or how stories can change over time or with different story tellers; you can even discuss the use of humor in a story. The artwork complements the story perfectly, adding little touches and details as well as illustrating the text. The colors are dark, but not dreary or oppressive, as befits the story, and the pictures are whimsical and just a little cartoonish. If you have a child three or older, and they like humor or fairy tales, or both, get them this book. You'll both enjoy it.